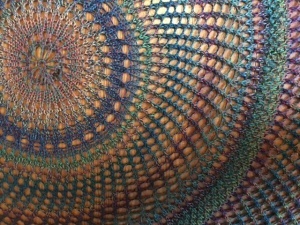 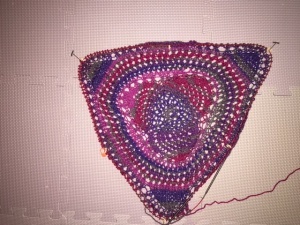 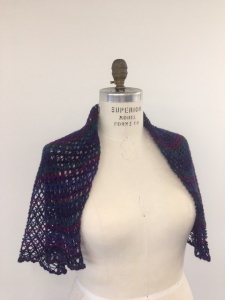 Recently I decided to try knitting a circular pattern shawl from some left over sock yarn in the stash. 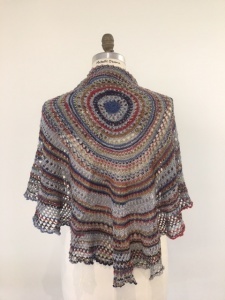 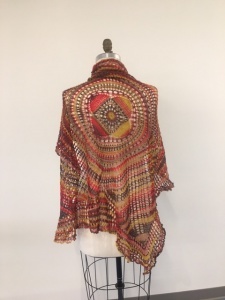 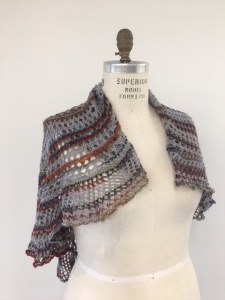 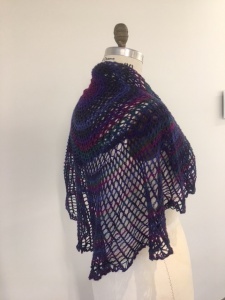 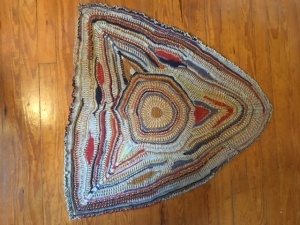 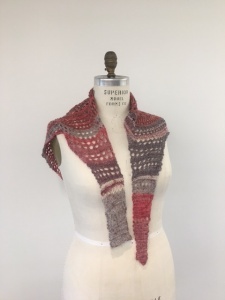 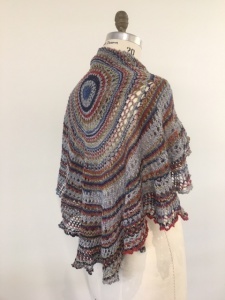 In Zimmerman’s project, she starts with 9 stitches, knits a round, then doubles the stitches, with a yarn-over-knit-one increase, (18 sts) then knits three rounds, doubles the stitches again (36 sts), then knits six rounds, doubles to 72 sts, knits 12 rounds, doubles to 144 sts, knits 24 rounds, doubles to 288, knits 48 rows, doubles to 576, and ends soon after, probably just tired of the project. 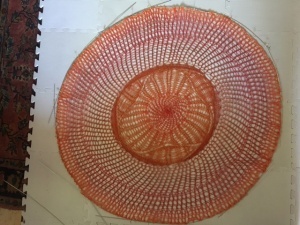 I modified the basic pattern in a couple of ways, Although I used the basic plan for doubling stitches and the same number of rows between increases, I used circular needles, beginning with two 16″ needles and working up, through two 24″ needles until I was using one, then two, 48″, later one 60″ needles, switching back to the shorter needle when doing the tails/ties. 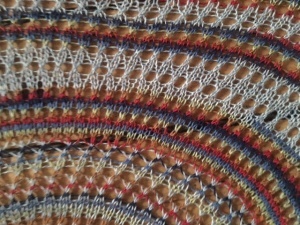 I also used a more lace like stitch in the knitted rows rather than straight knitted stockinette stitch. 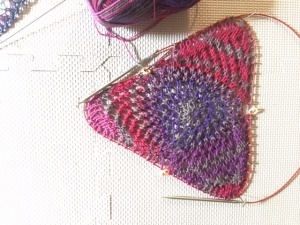 The stitch I used was basically a yarn-over-knit-two-together pattern which I varied. 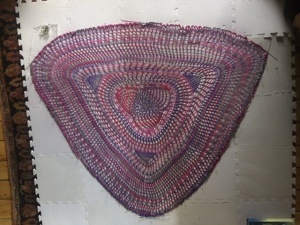 Sometimes I did the stitch all the way around, sometimes I did it once or twice and used a varying number of knitted stitches between to create more interesting patterns. 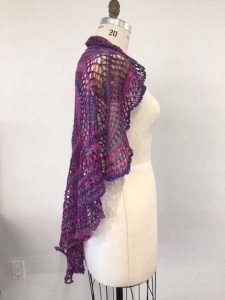 Also, once the piece was near the desired diameter, and I was running out of the yarn leftovers, I used short rows to make two extensions, as ties, so the piece might be a bit more useful. 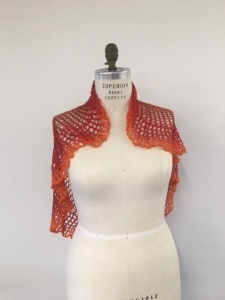 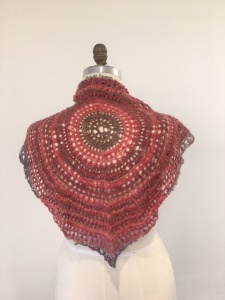 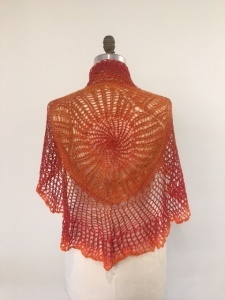 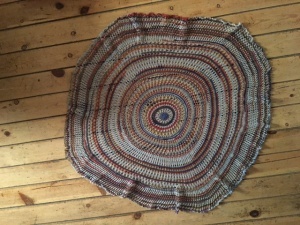 I did not have enough yarn to make it large enough (60 – 72″) for a circular shawl, so this seemed a reasonable compromise. 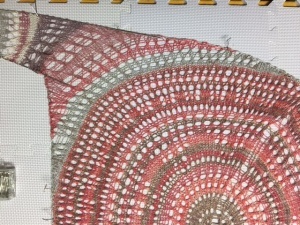 For an edge, I made a final round of doubling increases, taking the stitch count to around 1200 sts, then bound off the next row. 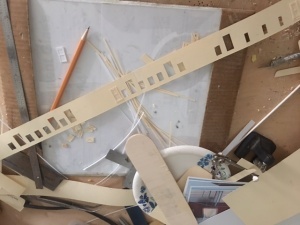 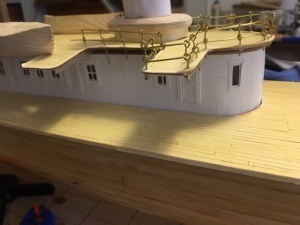 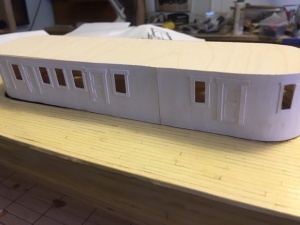 This made a rather dense edge which ruffled a bit and permitted blocking with the wires we use by sliding the wires though the holes created by the increase row. 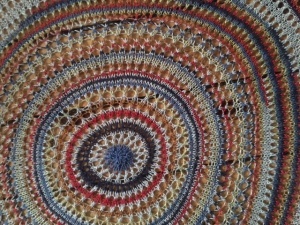 This created a very nice finished edge, a sort of combination of ruffle and picot edge when blocked out. 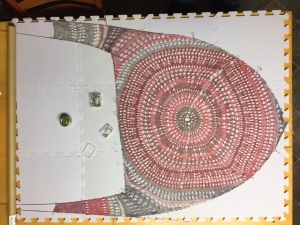 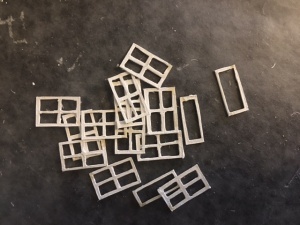 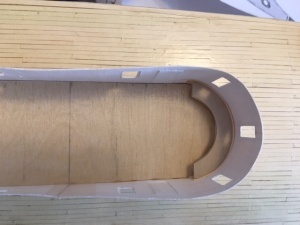 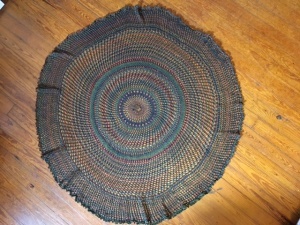 The mats are 12″ square, so you can see the piece ended up about 24″ wide and 36″ long. 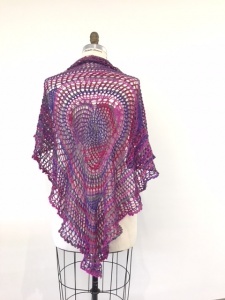 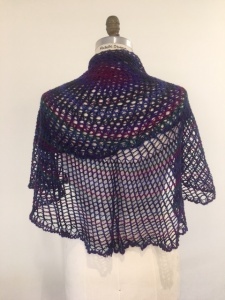 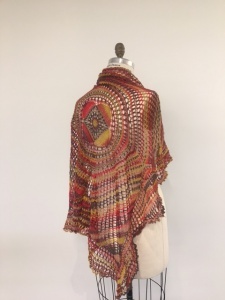 The piece turned out so well, I decided to make more shawls based on variations of the circular pattern. 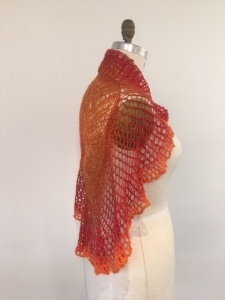 This decision resulted in trips to yarn stores and purchase of additional sock yarn, entirely neutralizing any benefit of reducing the amount of yarn in the stash. 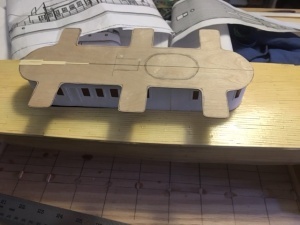 The variations used will be discussed in the next post. 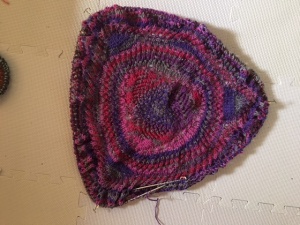 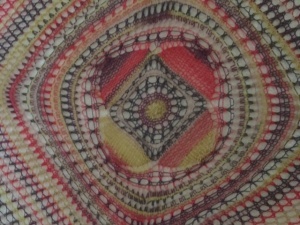 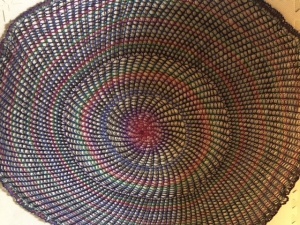 Some were straightforward circular patterns making use of the variegated sock yarns to create interesting patterns. 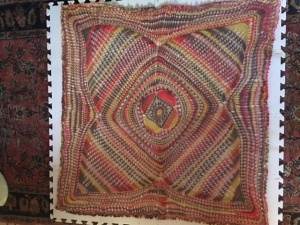 Others were variations is shape, mostly created using short rows. 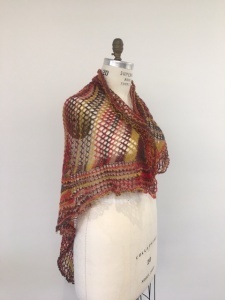 If you need to refresh on short rows, you might like to do it now, before looking ahead.